It was March 2014. Pelagic's Colin Sarfeh was in town from California, in the midst of a Florida tour. 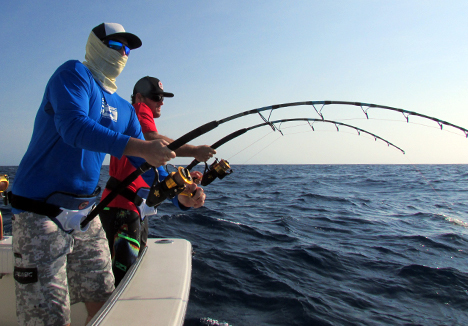 First, it was off to the Miami Billfish Tournament, to watch Bouncer Smith take top honors. 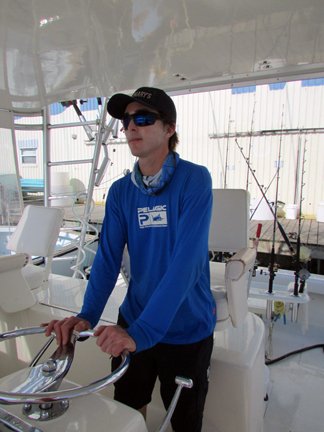 Then, it was up to Destin, for the Crab Cruncher Cobia Tournament and a stint at High Performance Offshore—a Pelagic franchise store in Harbor Walk Village. As these two events were a week apart, we had a bit of time on our hands and Colin had never been to the Keys. There was a perfect remedy for this. Captain Nick Stanczyk fishes out of Bud N’ Mary’s in Islamorada. In addition to being a really nice guy and someone quite interesting to have a beer with, Nick is a hell of a fisherman. He grew up there, and his family owns the iconic marina. Looking around the tackle shop, there are pictures of Nick in his younger days with giant permit, bull dolphin nearly as big as him, and all manner of flying tarpon and jumping swordfish. As a long time PELAGIC Pro Team Captain, Nick graciously offered to put us onto something for Colin’s Keys baptism. It was a bit early for the big dolphin. There were a few sails around, but it wasn’t lights out. This spring has been windy enough to piss off most anyone who likes fishing and our window was no different. We were to fish on Monday, which provided us a bit of a break between blows. Our plan was to do something a bit different. 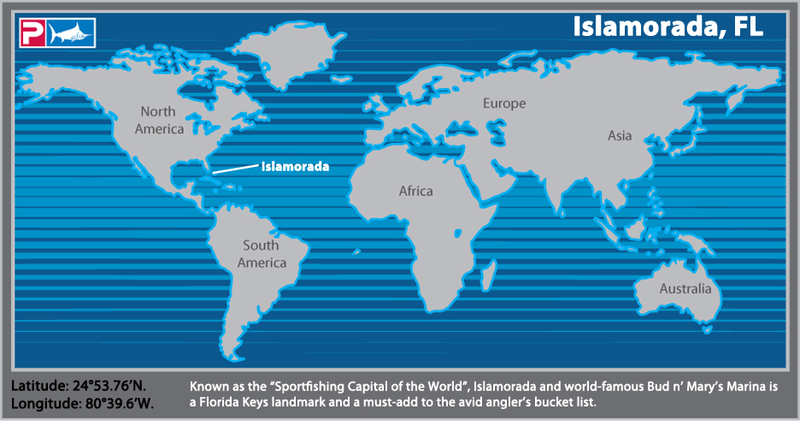 Islamorada is an incredible fishery—both on the humps offshore and in the back country. 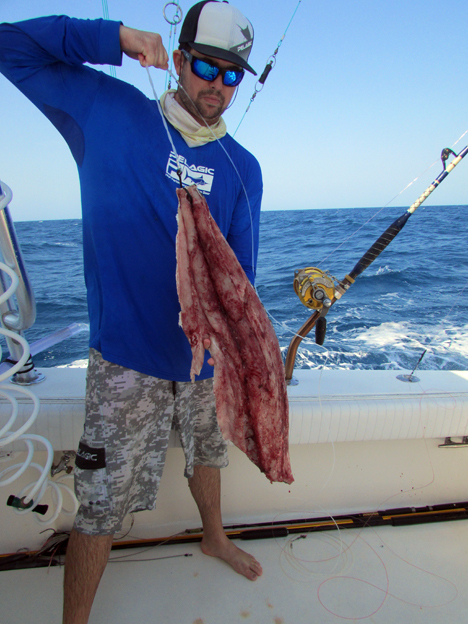 Spring time in the Keys means the appearance of wahoo, blackfin tuna, and big dolphin. But we had something a bit more menacing in mind… tiger sharks. Once to the Marina, we met up with Nick who showed us to our accommodation for the next two nights. We were staying in a house boat. It was a suite-- with one bedroom, a kitchenette, and a fold out in the main room— and it was awesome. 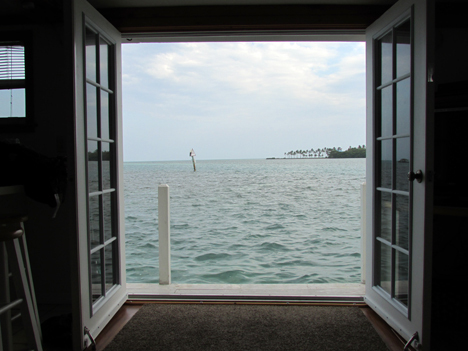 The back door opened out onto a platform facing the flats that lead offshore. Tarpon were rolling ten feet away from the couch. It was a hell of a cool place and we were excited to be there. 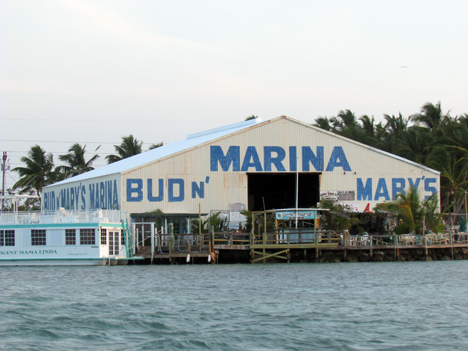 BELOW: Iconic Bud n' Mary's Marina // Not a bad view from the Lucky Lady House Boat (available as one of your lodging options at Bud n' Mary's Marina). 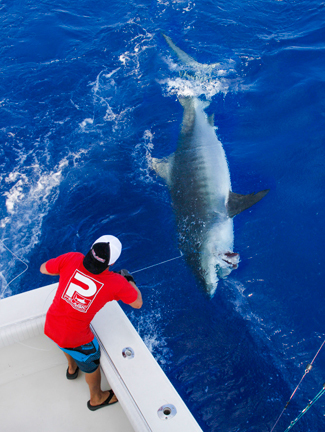 Spring time brings with it an annual migration of big tiger sharks and we were out to catch one. We hopped aboard Nick’s B n’ M II, a 36’ Jersey Devil Express. Joining us was Nick’s buddy, Will McCabe. We ran to Alligator light to chum up some bait, before it was offshore to catch some shark bait. With a live well full of cigar minnows, Nick hooked us up with a couple jigging rods connected to butterfly jigs. 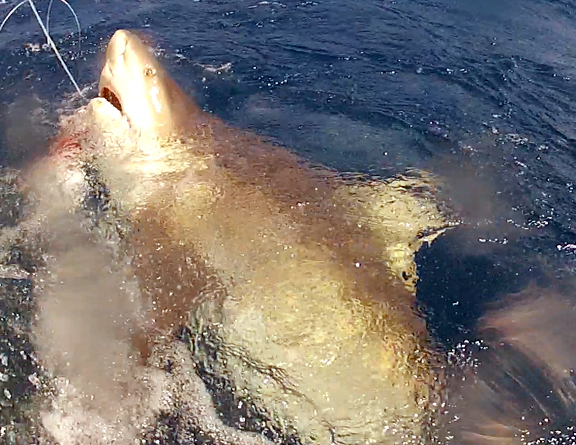 BELOW: XXL Tiger Shark for one of Capt. 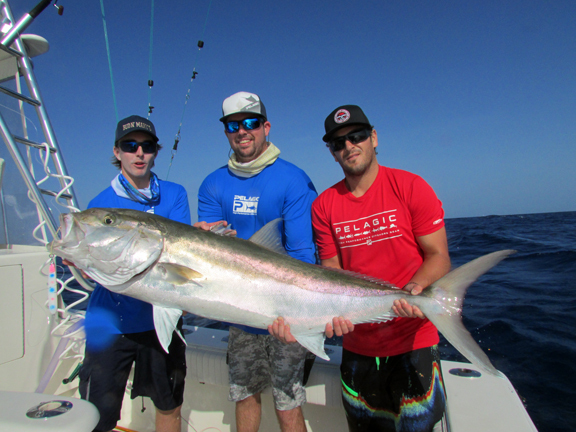 Nick Stanczyk's lucky clients (caught 2 weeks after this trip) // A 12' cast-net is a Florida Keys institution. 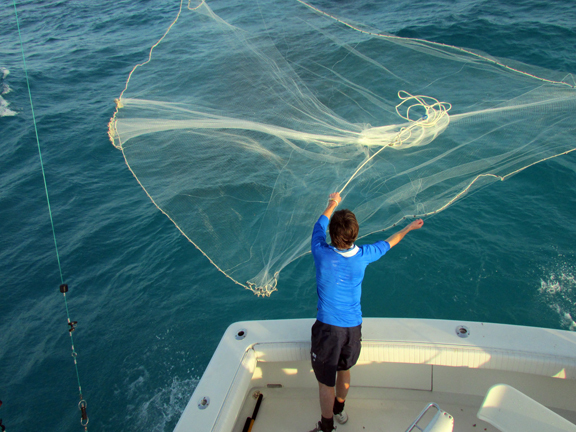 Colin and I slung the jigs down to the pile of stubborn, brown reef donkeys waiting below. We caught a pile of amberjack. The biggest was upwards of 50 pounds. There were a couple other nice fish, upwards of 40 pounds, that were relieved of the back ends of their bodies mid fight. The tenacity of the amberjack once hooked made it almost a relief when they were eaten and could no longer induce back aches. Small jacks were put in the live well to be bridled and put down alive, the larger brutes were to be filleted and floated back as slabs. 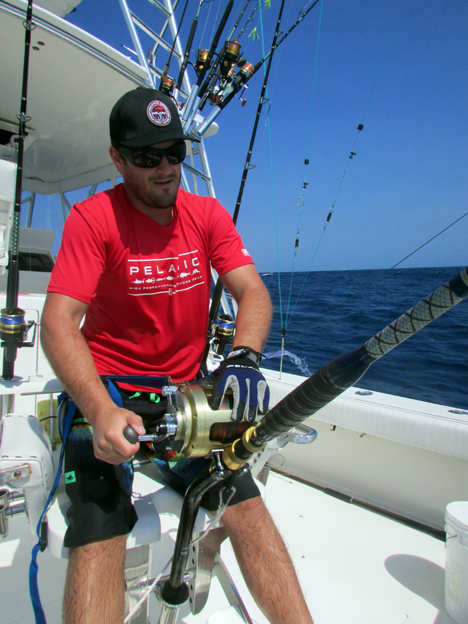 Nick’s shark rigs were 700 pound mono leader. On the business end was a 20/0 or so circle hook, connected via a loop formed by wrapping the leader around itself. The wraps stretched to about 18 inches above the hook. There were single crimps just above the hook and at the end of the double leader. It was a good set up. The reel was an 80wide, spooled with braid below the 20 feet of leader. Upon positioning the boat for the jaws hunt, we were ready for action. 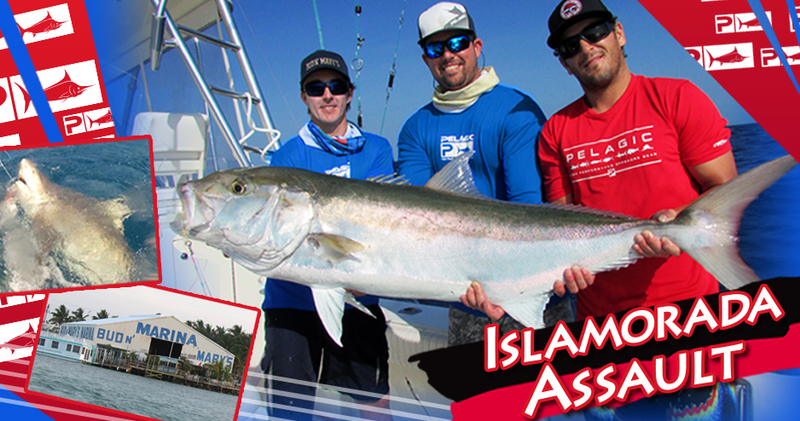 Colin’s bait was the deep rod-- a haplessly kicking 15 pound amberjack dropped, alive to the bottom. Mine was a seven pound amberjack fillet drifted back under a balloon. I didn’t take long for Colin’s bait to be transitioned into the afterlife with the squeal of the clicker. After feeding the accoster for a few seconds, the reel was engaged and Colin was in the chair. His quarry was heavy and its head shakes attested to the fact that it wasn’t happy. BELOW: Shark fishing is not for the faint of heart... This 7 pound slab of bait is proof // Colin saddled up in the chair with a beast from the deep. After a few minutes of cranking, a big dark shadow appeared. It was a bull shark and it was a healthy one. Through the shoulders it was as big around as a whiskey barrel. Its small beady eyes and menacing face made me pretty glad that I was on the boat and this creature was in the water. We pulled it up to the surface, Nick stuck the go pro in its face for some pictures. The toad of a shark then chewed through the leader and swam off to resume its life of doing whatever it feels like. Twenty minutes later, my rod squealed. After 10 minutes on the stick, the line slacked and the fish got off 50 feet behind the boat. 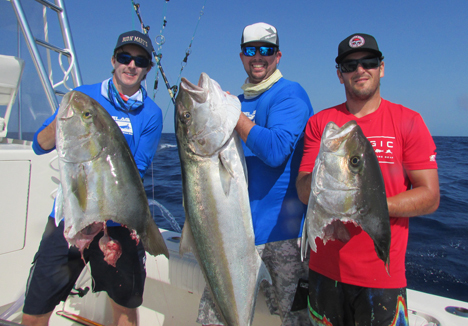 The amberjack fillet had come off the hook and drifted up the leader. The bait was still threaded on the line, but the fraying and saw marks provided witness to what appeared to have happened—another shark followed the hooked fish up and tried to eat the bait. This had the effect of liberating its buddy—which Nick imagined was another bull shark. 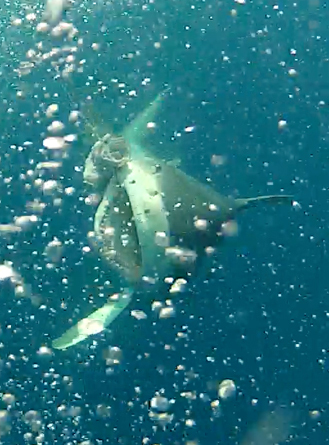 After a while of more sharking, we ran to some other structure to drop on some tile fish. We then ran to the Eagle, an inshore wreck that is covered by marauding schools of all kinds of fish. We were after permit and Nick spotted them from the tower. They were here in numbers, but they were being harassed by bull sharks and nervous. After throwing crabs to them on several passes, we enticed a bite and I was hooked up. The fish was a good one and fought vigorously. After 20 minutes on the fish, the fight changed and the pace of the line exiting the spinning made it known that I was now hooked to the bull shark that ate the permit. After messing with the permit for a bit longer and drifting a bonito or two back to hook the sharks that stole our permit, we called it a day. Fishing on the B n’ M II with Nick was a blast. Staying at Bud N’ Mary’s on the house boat was quite the experience. It was Colin’s first time in the Keys… it will certainly not be his last.